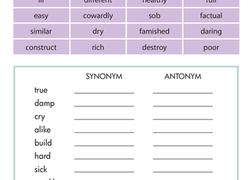 Looking for a worksheet to help you child work with antonyms? This printable is perfect for those who need help with their vocabulary. There's an Ant on My Aunt! 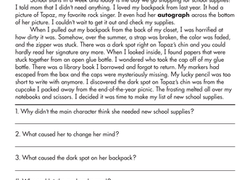 Searching for a worksheet to help your child with their vocabulary? 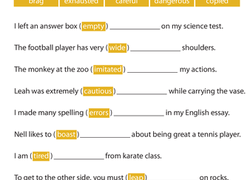 This printable will help him get a handle on "homophones," or words that sound the same. Use this exercise with your students to practise identifying seeing how words are connected. 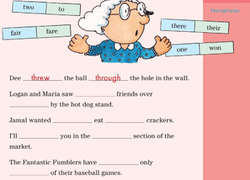 As your students complete the analogies, they will notice antonym relationships. 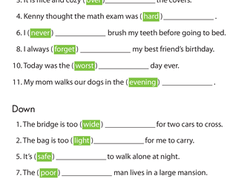 Help your child get on track with synonyms with this year four worksheet, which challenges her to match words that are synonyms.